Don't leave VEHICLE SECURITY at the hands of a thief! 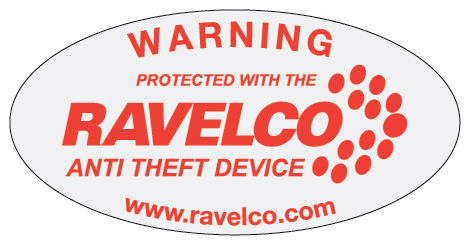 RAVELCO Anti Theft is the REAL solution to preventing auto theft BEFORE it occurs! RAVELCO of New Mexico is the EXCLUSIVE Distributor for the state of New Mexico! to ensure you are getting the real thing! and other INTERNET auction websites . . .
RAVELCO has an impeccable track record and has become the standard for security in all vehicles throughout the world. Because of this, copycat companies have tried to use the RAVELCO'S good name to cut into what we have earned through 41 years of service. To protect you as the customer, we advise you to thoroughly check out our dealer's page to make sure that you are purchasing a genuine Ravelco. If you do not see their name on our dealer's page you are buying a fake, knock-off copy of the Ravelco from an unauthorized source. In the late 1990's and early 2000's, fake knock-off copies of the RAVELCO were manufactured outside the USA. These countries were Brazil, Mexico and China. These knock-off copies (fake RAVELCOS) were not manufactured to the same tolerances and specifications that we use to make our Ravelco bullet-proof. Their fake knock-offs shorted out, melted and some even caught fire. They also copied our packaging (boxes) and the printing to look like our genuine product. Trying to salvage their businesses, these pirates who were manufacturing these knock off copies called us and asked our techs what were they doing wrong in their manufacturing. They even had the nerve to ask us if we could send them the specs and tolerances that we used on our Ravelco. Of course we told them to take a hike and these pirates went out of business in no time. After a short while they started trying to unload their inventory wherever they could trying to re-coup some of their money and investment. Today, there are still a few of these bogus sellers who show up occasionally on the above listed websites trying to sell their fake knock-off copies of our Ravelco Anti Theft Device. These bogus sellers all say the same thing and claim to have the genuine Ravelco, but no matter what they claim, "that they were acquired from an old distributor" or "a former distributor" - Blah Blah Blah . . . they are not and never were. They are scam artists. Don't fall for their baloney! WHY DO YOU THINK ALL THE INTERNET SELLERS STATE . . .
eBay LEGAL DEPARTMENT . . .
Our attorneys have contacted eBay and warned them about the potential problems and problems in the past with fake knock-off copies of the RAVELCO being sold on their auction site by unauthorized sellers. Sadly, with eBay being greedy they have failed to comply and remove these sellers. There is a company in Brazil, Ravelco Do Brasil that manufactures a black triangle shaped anti theft device. This company went so far to even use our trademarked name "The Ravelco" on its device. They are trying to capitalize on Ravelco's good name. People from Brazil contact us all the time asking if we are the same or at all affiliated with the company in Brazil that is using our name. When we tell them "NO WE ARE NOT" their very next question is where can they get the genuine Ravelco? There is also a Black Ravelco look alike made in Sweden with only 14 pins. These companies know that our Ravelco is by far the best anti theft device made in the world today and want to jump in and try to capitalize the market along with us. 1.) The bitterness of a bad deal remains long after the sweetness of a low price is forgotten! 2.) Only buy your RAVELCO from an AUTHORIZED and CERTIFIED RAVELCO DISTRIBUTOR or DEALER to insure you are purchasing a genuine RAVELCO.